I love the old book, Earthly Footsteps of The Man of Galilee and the Journeys of His Apostles. The book contains 400 original photographs by Robert E.M. Bain, taken in Egypt, Israel, Syria, Lebanon, Turkey, Greece, and Italy. Descriptions for each photograph are written by James Lee. These photographs depict the life of Christ and the influence of his ministry—the locations where Christ was born, baptized, crucified, as well as scenes from his prayers, miracles, and sermons. This resource also contains photography of sacred sites between Jerusalem and Rome. In these photographs taken in the late 1890s, not much had changed in Palestine from the time of Jesus until then. When one sees the vintage, sepia photo of a lone colt tied to a tree in front of a house, one can easily imagine the scene when Jesus told the disciples to go find the young donkey so He could ride into Jerusalem. When one sees a cracked and browned picture of an oil or a flour mill, we can easily imagine commerce and trade as Lydia had with her business of purple. Here below is a fence in Palestine. The caption explains what the reader is seeing and also contains thoughtful ponderings about Jesus and His Gospel. What I think of when I see this photo, is the impenetrable aspect of the fence and the strong deterrent of thorns. The verse from the Parable of the Sower springs to mind. The agricultural and localized references written in the Bible are so much better appreciated by us in our day when looking at photos like this, or when I seek to learn about the plants and animals of the region. Sadly, the book is out of print and very rare and expensive, but fortunately, it has been digitized and I can look at the photos on my Logos 6 software. By the way, if you are reading this before noon on this day, Tim Challies has a Free Friday Giveaway that runs until noon on Saturday, raffling off a Logos 7 Silver package. A hefty gift, if you sign up and become the lucky winner. 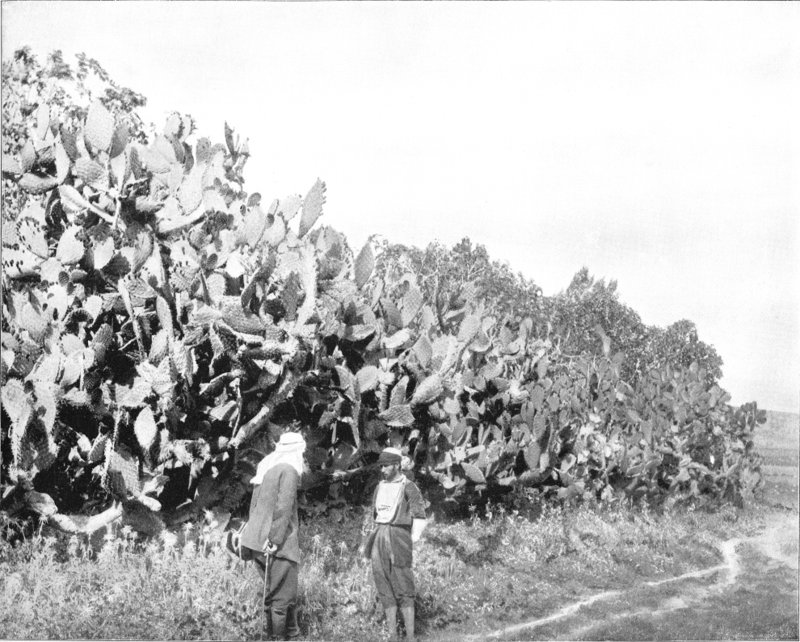 ‎The thorny cactus abounds in Palestine. It forms a most secure fence, growing sometimes to a height of twelve feet. Beyond this wall are fig trees and olive trees, pleasant vines and fragrant flowers. The man in the picture with white head dress and staff held behind him is the dragoman of the photographic company of 1894. In the early morning, when Elisha’s servant arose from his bed and went forth “behold, a host compassed the city both with horses and chariots.” Then the prophet’s servant was afraid and he said: “Alas, my master; how shall we do?” And the prophet answered: “Fear not, for they that be with us are more than they that be with them. And Elisha prayed and said: Lord, I pray thee open his eyes that he may see. And the Lord opened the eyes of the young man, and he saw; and behold, the mountain was full of horses and chariots of fire round about Elisha.”—2 Kings 5:13–18. The reality of the invisible realm, of God and His angels, of life immortal, of the protecting influence of heaven in all the struggles and endeavors of earth—these are doctrines which the Man of Galilee came to proclaim to the race of man. These are doctrines which gave strength and comfort to Mary in her pilgrimage from Nazareth to Bethlehem. Jesus is utterly fascinating. These long-ago glimpses into the lands upon which He walked are endlessly interesting and encouraging. I hope you find them encouraging also. Of course, nothing can compare to the lands that await us, a renewed earth and domicile in New Jerusalem. Jesus is worthy to be praised, for His earthly sinless life, and His holy sovereign reign over all the earth and universe beyond.